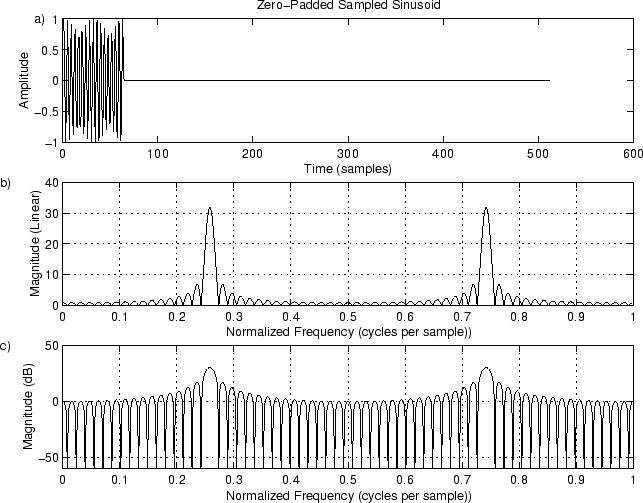 Figure 9.4:Zero-Padded Sinusoid at Frequency . a) Time waveform. b) Magnitude spectrum. c) DB magnitude spectrum. With the zero padding, we see there’s quite a bit going on. In fact, the spectrum has a regularsidelobe structure. On the dB scale in Fig. 9.4c, we now see that there are indeed negative dB values. This shows the importance of using zero padding to interpolate spectral displays so that the eye can “fill in” properly between the samples.